I've had a few people ask me if I have any tutorials on flowers. Nope, but I said, I'd make one. And I remembered why I hadn't done a tutorial, they take forever!! But since I love you guy's, I did one up for the rolled flowers. I originally got this idea from a headband I bought a boutique. It's alot looser than the one's I have been making, but I really like these. They are so easy and so pretty. You'll need. Two felt circles that coordinate with your material. The bigger of the two is the one you will use as your base for the flower. Then your scissors and glue gun. You could also use fabric glue if you wanted to. I tried it and it didn't work nearly as well as the trusty old glue gun. Depending on the size you want your flower, your going to tear yourself a strip of material, about 1 to 1 & 1/2 inches wide. For this large flower, my fabric was 45 inches. For a tiny flower, you might only use about 12. I always figure that if I want to finish the flower off, I will just trim the excess material off. Put a dab of glue in the center of your felt. You can tie a knot in your material and place it onto the glue, or you can simply stick the material to the glue. I do it that way, because it makes it easier to put buttons into the center later on. Your going to take your material and start twisting it around itself. I do a few inches at a time. Then you simply start to roll it around the center piece and glue the fabric to itself. You can glue it directly to the felt, and you will want to do that every couple of times you glue, but not every time or else it gets to hard and not pliable. And from here, you just keep twisting and gluing until you get the desired size of flower you want. Sorry, I should have cropped this to get a closer picture. But here is what your back will look like when you are done. If you have extra felt sticking out, just trim it off. And this isn't a great shot either, but take the end of the material and simply tuck the ends into a the last twist you did and glue it. The best place I have found to get clips is to buy them at a beauty supply store, like Sally's. I got 100 clips for $5.00. But here you'll take your second felt circle and stick it in between the the prongs of the clip. Now put a liberal amount of hot glue to the top of the felt. Then stick it to the back of the flower. I put the felt in between the flower and the prongs because then you don't have to mess with getting the glue perfect and it doesn't get caught in your hair. 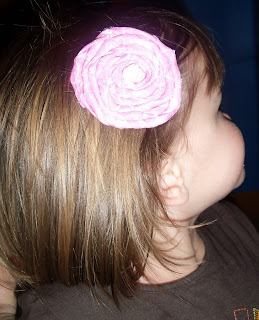 Now add a button and glue it to the center and you have a darling rolled flower. These are super cute when attached to a headband. Like the Mellow Yellow headband I listed in the giveaway. They are also cute on clothes, bags, and just about anything else you can think of. I have another project to show you with these, but I don't want to give anything away!! Hopefully this made sense and helps someone out. Happy flower making! Very cute! I can't wait to try this one! These are super cute. I am going to be trying them.